Wedgewire screens are superior for retaining media, filtering, and sizing. In comparison with wire mesh and perforated metal, wedge wire continuous slot screens have more open area, have very precise openings, are stronger and more durable, are virtually non-clogging and reduce media abrasion. Wire mesh and perforated metal may be less expensive initially, but wedgewire screens offer easier installation and long-term operating and cost benefits. Wedge wire screens have maximum design flexibility, can be constructed in a wide variety of shapes and sizes from a variety of corrosion resistant alloys such as type 304, 316, 316L, 321, and 410S stainless steels, as well as nickel alloys such as C-276. Greater resistance to stresses of differential pressure and temperature cycling. Precise slot sizes are available to meet system requirements. Screens can be fabricated with slot openings from 0.025mm to 12.5mm in 0.025mm increments to dependably retain catalysts, resins, or filter sands of even very small size particles. Maximum effective flow area and operating efficiency is maintained. Costly downtime for cleaning plugged screens is minimised. Economy is achieved through the simple design, which results in a screen with low initial cost, minimum maintenance needs and simplified installation. Costly support media can be eliminated. Non-clogging slot design results in low head loss for lower operating cost. Non-clogging slot design results in reduction of downtime caused by plugged screens. 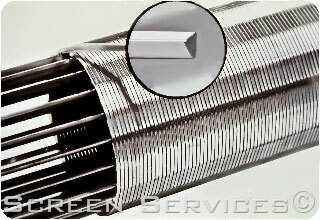 High strength and durability reduces chance of screen failure and loss of media. Due to the smooth surface and rigid construction, abrasion of media particles is eliminated, increasing the effective life of expensive media, resulting in longer intervals between cleaning cycles. Screens constructed with wedgewire have significantly greater durability than perforated metal and wire mesh. For some answers to common questions about wedge wire screens, see the FAQ.